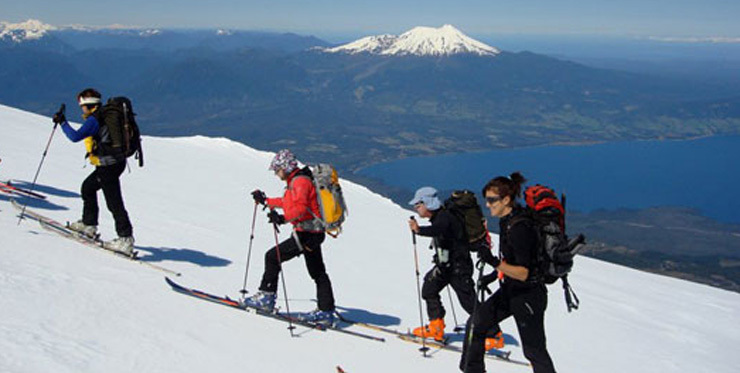 This trip are developed into the south area of Chile, we drive from Santiago to our first destiny Chillan volcano, 5 hours far from Santiago and each day go more southern to get Villarica Volcano, is a 5 volcanoes exploration ski touring in the Araucania region and lake district. Company name: Asesorias en Montaña Ltda. 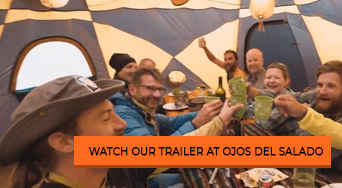 With a U$500 deposit per climber, a reservation will be automatically generated. We send you a paypal link. Must be made 30 days before expedition departure time. This must be paid with bank transfer. 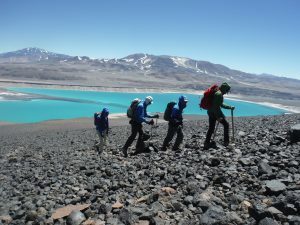 Cancellations made between 29 to 16 days prior the expedition will be refunded up to a 60% of the deposited money, or, if you prefer, you can keep the reservation up to one year for a new scheduled expedition of the same value. Cancellations made 15 days (or less) before the expedition WILL NOT be refunded. This cancellation policy covers any and all reasons for canceling participation in the expedition, including personal issues, accidents, illness, acts of nature, bad weather, etc. Note: please ask your normal travel company about “Trip Cancellation Insurance”. We meet at the airport with all the group then we will drive to Chilllan to spend the night (4.3 hours driving from Santiago). Here we make a talk about the trip and snow condition, review the equipment and check the itinerary. Scheme: Pick up, transfer Chillan, talk about the trip. 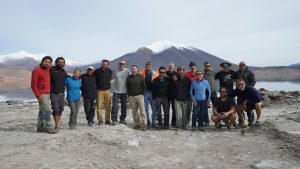 This day we will ascent the summit of Chillan volcano our first challenge, we will drive to the ski area and then make the ascent of 1400 m to get the summit, after that we ski down to get our truck or minivan who will drive us to Antuco volcano. This day is time to ski in Antuco volcano, after make a short drive to the base we ski touring all day, amazing views from the rest of the volcanoes will accompany us, after this amazing ski challenge we will go back to our refuge and pick up our gear to drive to Lonquimay area. This day early morning we will drive to Corralco area to ski in a great area full of araucarias and a great view of the lake district, after ski we will visit a hot spring to relax and enjoy this spectacular panorama. This day we will drive to get in 4 hours to the Lake District, to ski in LLaima and Villarica Volcanoes is a nice place where we will spend a few days skiing. The rest of the day is free. After our breakfast we will ski to ascent to the summit of Lliama Volcano is a big challenge with a big traverse but time enough to enjoy this incredible spot, after ski down we will drive to Pucón area to prepare our last challenge. This volcano are 20 kilometers far from the village and in just a 40 min we get there to enjoy our last ski day, Villarica volcano is one of the most active volcanoes in Chile, actually made it last eruption in 2014, actually is possible see lava flows into the crater. From Pucón we will drive to Santiago is a 10 hours drive to get your hotel in Santiago. On this day we’ll finish the expedition, is optional the way you want finish your trip we also can drive you to the airport in Temuco 2hours far from Pucón. The itinerary described above is a guideline. Be aware that some changes might be done during the expedition due to weather issues. If the expedition is compromised due to a weather condition like snow storms with intense cold, or to an acclimatization difficulty from one of the members of the expedition, the chief-guide has the obligation to modify or even abort the whole expedition program if needed. The above is for you to be aware that if something goes wrong you need to understand and (fully) cooperate with the guide, since any wrong or “too-late” decision might be fatal. 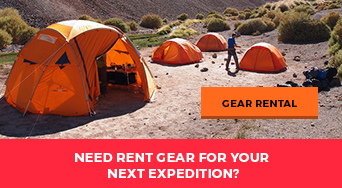 All group equipment; rope, ice-screw, compass, stove, GPS, etc. Backcountry safety gear, transceiver (A.R.V.A) shovel, probes. Nourishment: This is another crucial point to consider when preparing yourself for the expedition. Your feeding routine is the cornerstone to your training exercises and the expedition itself. That’s why we strongly recommend you to eat food rich in carbohydrates, proteins, fibers and minerals. Remember before and after your training exercises you must hydrate yourself. Passport: 6 month left before expiration date and enough blank spaces for customs procedures. Vaccines: No vaccine is needed to enter Chile. Water: The water is good. Still, we recommend you to drink bottled-water during your first days in Chile so your body gets used to the water here. Money exchange: If you need to trade dollars into Chilean or Argentinean pesos, do it in official places. Language: Chile’s and Argentina’s official language is Spanish. On regular basis, it will be hard for you to communicate with ordinary people. That’s why we recommend you to get a pocket-dictionary. Nevertheless, most people working in tourism speak fluent English. Electrical grid: 220[v] – 50[Hz]. You’ll easily find electrical transformers in Santiago or any large city, but if you have the time, get one in your country. In order to avoid any injury we strongly recommend to all the expedition members to have the mountain equipment described below. Each piece of the equipment will help us on the summit day, which may be terribly cold (even -20ºC /-4ºF). The proper equipment is crucial to achieve our goal. Bag pack from 35 to 60 lts.